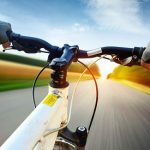 There are many different types of bicycle accessories on the market today, from lights, reflectors, baskets and even bicycle speakers. Each of them has a specific purpose, whether that be safety, storage or entertainment, whatever the reason, there are so many to choose from. This article will focus on Bluetooth bike speaker and the many options that are available. As part of our preparation for the article, we did plenty of research online and discovered numerous bicycle speakers. From all those that we found, we put together a list of our best bicycle speakers. Along with the list, we included a brief review of each of the ones on our list. The S404 Bluetooth Wireless Bicycle Speaker is designed for the rider who wants to enjoy their favorite music or sporting event while they are riding. 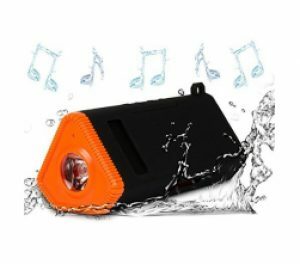 Venstar built this ultra-rugged speaker out of high impact plastic for extra long durability and covered it in a rubber so that it would resist water, dust, and other elements. The built-in Bluetooth 4.0 technology allows it to pair with your mobile device and allow you to listen to your favorite music without having to have your device out. It also includes an FM radio receiver so that you can receive all of your favorite local FM radio stations anytime. It fits securely in the mount that attaches to either your handlebars or frame and can double as a bottle holder. The Venstar S404 is a high-quality portable wireless stereo speaker designed to be mounted on a bicycle. 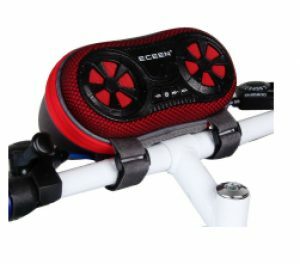 The ECEEN Wireless Bluetooth Speaker comes with a bicycle mountable case that can be attached to either your handlebars or bike frame. The speaker features two full range speakers and a built-in amplifier for boosting the sound from any MP3 player or mobile device. The connection can either be using the built-in Bluetooth 4.0 receiver or 3.5 mm auxiliary jack and cable plugged into the speaker. The speaker and case are made of high impact plastic for rugged durability. Using the built-in microphone you can also answer phone calls that you receive on your phone without having to pull out your phone. The ECEEN Wireless Bluetooth Speaker would make a great choice for any cyclist looking to have a way to listen to their music while they ride. 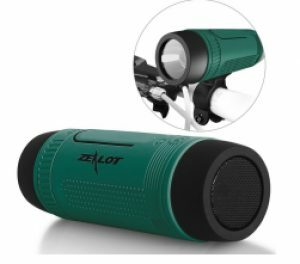 The Zealot S1 Bluetooth portable speaker is made of high impact plastic so that it is extremely lightweight, yet durable enough to handle the shock of being mounted to your bicycle. The package includes a mount that fits securely to most any bicycle handlebars. The S1 also includes a really bright LED light that can act as a headlight for a night or predawn riding. The speaker includes a neodymium amplifier and 3 Watt speakers system. The Bluetooth 4.0 wireless technology allows you to wirelessly connect to most any Bluetooth enabled MP3 player or smartphone. The heavy-duty rechargeable battery holds enough power to use it as a charging station for a mobile device. You can also connect any auxiliary cable to the 3.5 mm jack and directly play MP3’s on the S1. 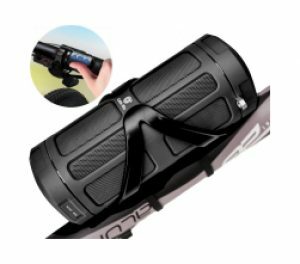 This multipurpose device can be both a speaker and headlight for a night or predawn riding. The Celtic Blu Bluetooth Speaker is one of the most powerful of all the bicycle mounted wireless speakers on our list. It features an amazingly powerful 16 watts of sound w/surround technology. This means that you really will be able to enjoy your favorite music as you are riding around town. 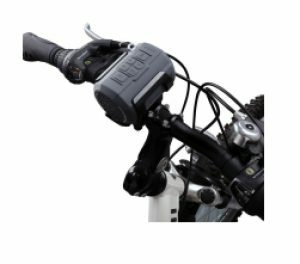 The mount is designed to be mounted on the bike frame and the easy to use remote control mounts to the handlebar for easy access. Bluetooth 4.0 wireless is capable of connecting up to 100 ft away any Bluetooth enabled device. There is also a microSD card slot for holding 100’s of music files. There is also an FM receiver so that you can pick up all of your local FM radio stations. The Celtic Blu Bluetooth speaker is the must-have bicycle accessory that no one should be without. The X97 Rugged Bluetooth speaker from Jarv is a powerful portable bicycle mountable speaker that can go anywhere your bike goes. It features enhanced bass and 6 watts of power for surprisingly crisp sound from a small speaker system. The Bluetooth 4.0 technology built in means that it can pair with any Bluetooth enabled mobile devices such as an MP3 player or smartphone. The duty protective case was designed to make it dustproof, waterproof and soundproof. You can even answer calls from your paired smartphone using the built-in microphone. The Jarv X97 Rugged portable speaker is the perfectly suited as a bicycle speaker using the included bike mount inside the package. The Portable Bluetooth Speaker from CLEARON is a great sounding portable speaker that features 360° Surround sound pumps at 8 watts of crisp, crystal clear sound. The included bicycle mount means that you can take all of your favorite music with you as you are riding. The high-impact plastic case makes it very durable, waterproof, dustproof, sandproof. The built-in powerful Bluetooth 4.0 technology means that it can pair with most any Bluetooth enabled device like a mobile phone or MP3 player. It also features a microSD card slot for loading music from. It also includes an easy to operate remote control that can be mounted conveniently on your bike’s handlebars. The CLEARON Portable Bluetooth Speaker is designed to be used for a multitude of uses including a bicycle mounted the speaker. 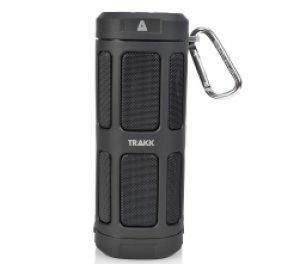 The ACTIV Bluetooth Bike Speaker for TRAKK is an ultra lightweight portable speaker that is completely encased inside a high impact plastic case that helps to make it dustproof, waterproof and sandproof. It delivers high definition, 360° surround sound with 16 watts of power. The powerful Bluetooth 4.0 can pair to any Bluetooth enabled device that is up to 100 feet away. Using the bike mount that is included in the package you can mount the speaker to the frame and use the handlebar mounted remote control you can easily control the total operation of the speaker. The 6000 mAh battery can be used as an emergency charger for all of your mobile devices. You cannot go wrong with this portable Bluetooth speaker that can be carried anywhere you and your bike goes. The powerful KMASHI LED Bike Headlight with built-in Bluetooth wireless speaker both added safety and delivers great sounding music. The features three levels of light with a maximum distance of 164ft. I deliver decent sound from the built-in stereo speakers. 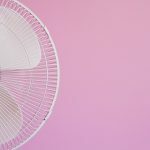 The built-in Bluetooth 4.0 technology means it can wirelessly connect to any Bluetooth enabled device up to 33 feet away. It also has a built-in 4800mAh rechargeable battery that can be used as an emergency charger for other mobile devices. The rugged high-impact plastic case keeps it protected from exposure to water, dust, and sand. The KMASHI Bike Wireless Speaker combination is a great safety device for your bike and it plays great music as well. This portable device is really four unique devices in a compact package that can be mounted on your bicycle with the included handlebar mount. 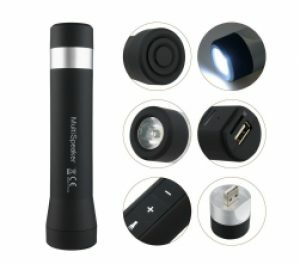 It can also be used as a handy flashlight/bike headlight and emergency mobile device charger. The built-in Bluetooth 4.0 technology makes it possible to pair up with any other Bluetooth enabled device like an MP3 player or smartphone. Using the built-in microphone you can also answer calls hands-free from your smartphone. 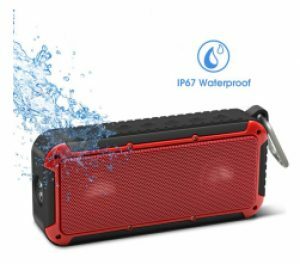 Unlike all the other Bluetooth speakers on our list, this one is not waterproof and it should not be used in inclement weather. 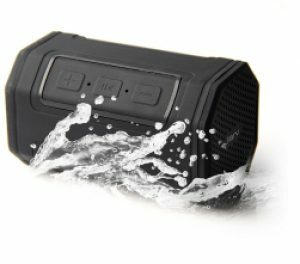 This is a very versatile Bluetooth speaker and other than not being waterproof it really good device. This lightweight, compact portable stereo speaker delivers 10 watts of power. It can be easily mounted to your bike using the handlebar mount that is included inside the package. 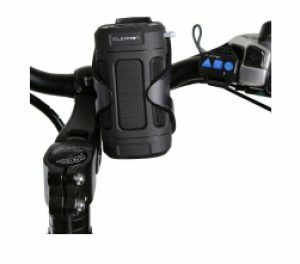 It also has a bright LED light that can be used as a safety headlight for riding at night or pre-dawn. The built-in Bluetooth 4.0 technology means that it can be paired with any other Bluetooth enabled device up to 33 feet away. It also has a 3.5 mm auxiliary jack that can be used to directly connect an MP3 player using an auxiliary cable. The heavy duty high impact plastic case helps to make it waterproof, sand and dust proof as well. The NewBee portable wireless speaker is the perfect bicycle accessory for the rider who likes to listen to music as they ride and often rides when it is dark.